In a recent piece for Defense One, Avascent Senior Associate Chris Meissner and Avascent Global Advisor Dr. Linton Wells analyzed the future of cyber warfare. They noted that while armed drones get the headlines now, in the future autonomous technology like artificial intelligence and machine-learning systems that select and attack targets autonomously will achieve far more powerful strategic results. Meissner and Wells discuss recent publications from the Defense Science Board, DARPA, and discussions with recent Cyber Grand Challenge competitors to note that the concept of “counter autonomy” is becoming more important in cybersecurity, where AI and machine-learning can help select a target autonomously but the target machine also can learn from the attack mounted against it, and design its response accordingly. The piece highlighted that it will soon become essential to incorporate both autonomy and counter-autonomy in cybersecurity team training and systems design, and to make them independently testable, concluding that the benefits for the future would be enormous. Read The Most Militarily Decisive Use of Autonomy You Won’t See here. Chris and Linton also discuss the future of autonomy in cybersecurity in the most recent Avascent on the Record podcast. Listen and subscribe here. Deutsche Welle recently analyzed Eastern Europe’s defense industry prospects as NATO promised to bolster its presence in northeastern Poland and the Baltics as of 2017. The move as seen as a “a measured response to what the alliance believes are some 330,000 Russian troops stationed on the country’s western flank near Moscow,” as NATO Secretary-General Jens Stoltenberg said. The move however adds to concerns that the response will lead to a new arms race with Russia. DW interviewed Warsaw-based Avascent Associate Dominik Kimla on the implications for Poland and its military strategy over the coming years. Kimla noted that Poland’s defense investments will transform its military from defensive-oriented force toward an emphasis on offensive capabilities that could serve to engage or deter potential enemies, namely Russia. Travelers have come to expect WiFi included with the usual amenities in the price of a hotel bedroom, and often go to a competitor, if is an added extra. Avascent Associate Andrew Penn and Writer-in-Residence August Cole analyze how hotel pricing structures can help airlines formulate the best pricing method to simultaneously satisfy customers and turn a profit from providing in-flight connectivity. In an op-ed for Avionics magazine, Penn and Cole dissect flight lengths and seat classes to find the best pricing structures for airlines in a world where a passenger must always be connected. Matt Vallone, Director of Research and Analysis for Avascent’s Analytics division, discussed the prospects for a budget deal in Congress with Joe Gould of Defense News. Matt highlighted the the challenges of addressing the current budget impasse with a so-called “minibus” of appropriations, which would bundle some appropriations measures, relative to an omnibus bill, and would address the operations of the entire government. During the recent Association of the United States Army Annual Meeting and Exposition, or AUSA, Defense News put out daily publications recapping the news and updates announced by the industry at the event. Following the conclusion of AUSA, Defense News published an e-zine recapping these dailies. 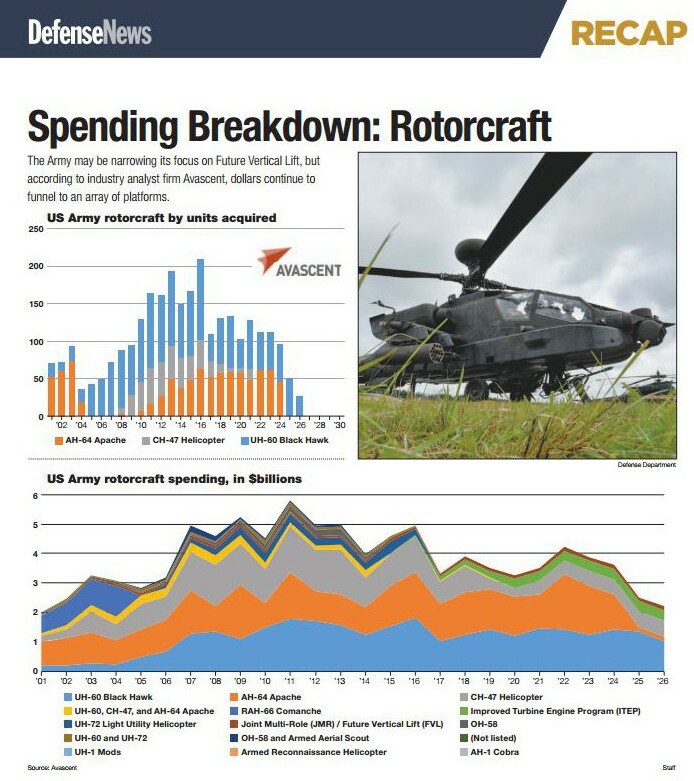 In this e-zine, Defense News highlighted that the Army may be narrowing its focus on Future Vertical Lift, as indicated by data provided by Avascent Analytics, which also illustrated that dollars continue to be funneled into an array of platforms. To read the full recap, click here AUSA Show Daily 2016 Recap, Avascent Analytics’ data features on page 8.